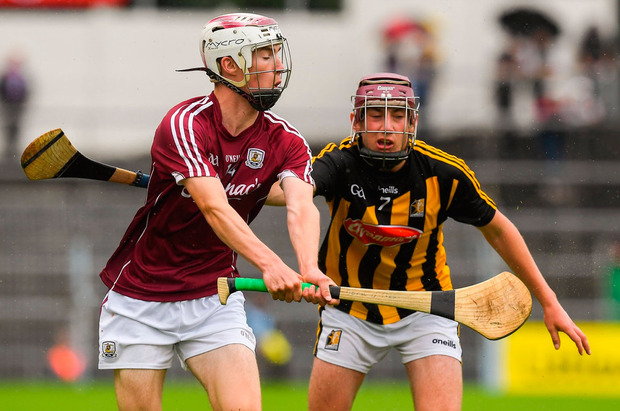 Dean Reilly and Donal O'Shea were both on song as the Galway minor hurlers tuned up to defend their All-Ireland title with victory over Kilkenny in Semple Stadium. Jeff Lynskey's side easily worked their way into the semi-final against either Dublin or Tipperary on Saturday week and from the early stages there looked to be only one winner. The champions showed top form at times, even though they cruised through the second half and allowed Kilkenny back into the game there. 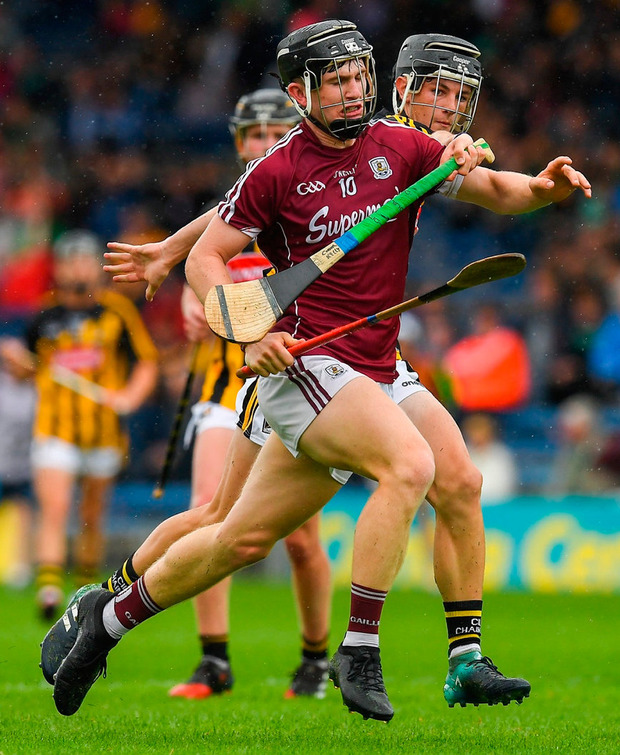 Reilly scored Galway's only goal to cancel out the first-half efforts from Cathal O'Leary and Ciarán Brennan for Kilkenny and Galway were 1-14 to 2-3 in front at half-time before they eased up in the second half. comparison Conor Kelly tried his best to keep Kilkenny in the game but despite his seven points they fell to their first defeat of the All-Ireland series having previously lost the Leinster final against Dublin. "We are waiting to kick off our championship, we were late starting in comparison to the rest of them," said Lynskey. 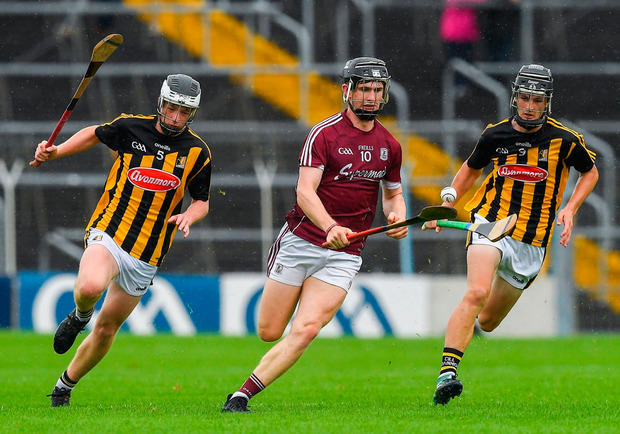 Galway's Diarmuid Kilcommins battle with Kilkenny's Conor Kelly. "But look - we're hungry and fresh so we'll have a huge chance in the semi-final." "Look, it was a super win. They are good lads and have worked incredibly hard since January. They're moving in the right direction, that game will bring them on again. "But like anything else going to Croke Park, it's going to go up another level the next day." Scorers - Galway: D O'Shea 0-10 (9f, 1'65), D Reilly 1-4, O Flannery (Padraig Pearses), J O'Donoghue, D Kilcommins 0-2 each, K Creaven 0-1. Kilkenny: C Kelly 0-7 (4f, 2 '65), C O'Leary 1-1, C Brennan 1-0, G Murphy 0-2, J Young 0-1. Galway - P Rabbitte; M Flynn, S Jennings, I McGlynn; S Quirke, S Neary (c), E Duggan; O Flannery (St Thomas), J O'Dongohue; D Kilcommins, S McDonagh, O Flannery (Padraig Pearses); K Creaven, D O'Shea, D Reilly. Subs: A Brett for McDonagh (40), C Flaherty for McGlynn (43), N Collins for O'Donoghue (54), C Cunningham for Creaven (56), A Conaire (Sarsfields) for Flannery (St Thomas) (61). Kilkenny - J Brennan; P Dempsey, J Young, C Korff; J Harklin, S Staunton, D Maher; C Rudkins, C Kelly (c); W Halpin, C Kenny, G Murphy; C O'Leary, C Brennan, J Morrissey. Subs: J Buggy for Halpin (30), D Crehan for Korff (h-t), D Coogan for Rudkins (h-t), K Hogan for Murphy (56).